Tonsilitis [Tonsillitis] can be detected as soreness under the jaw with a deep contact at No. 4. 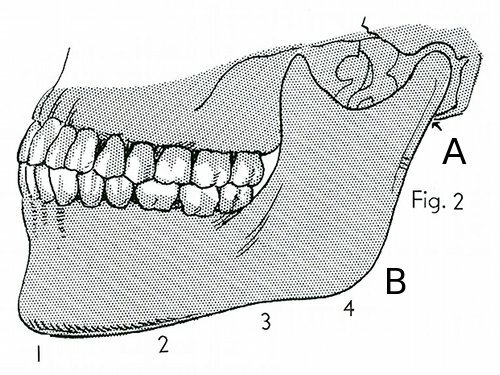 Release the corresponding area at the negative pole at the ischium. 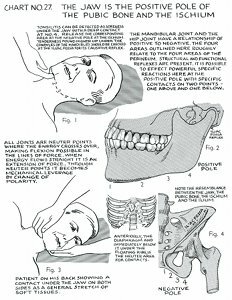 Tenderness found higher up under the condyles of the mandibles should be checked at the iliac fossa for its causative reflex. 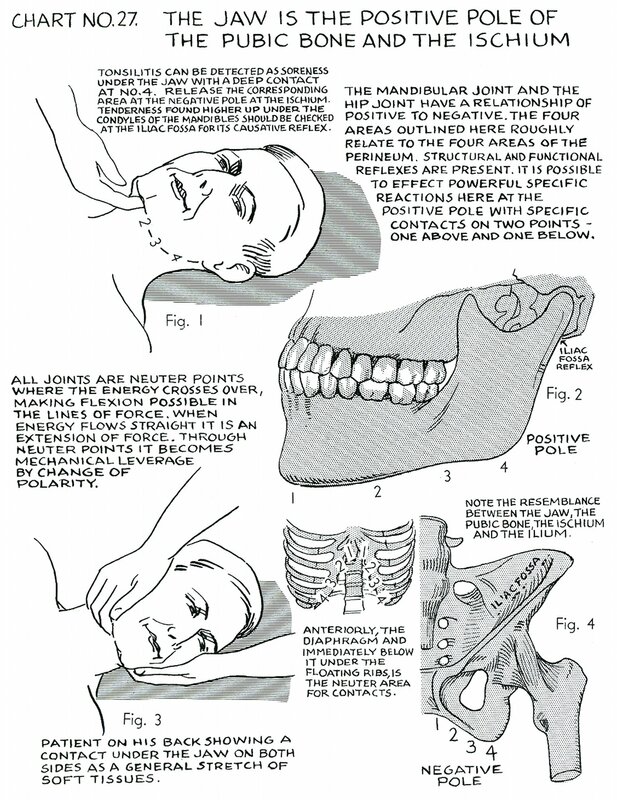 The mandibular joint and the hip joint have a relationship of positive to negative. 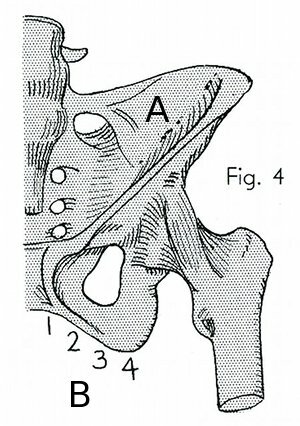 The four areas outlined here roughly relate to the four areas of the perineum. 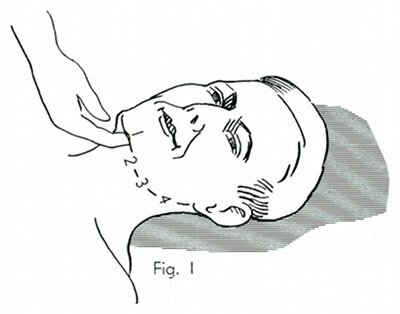 Structural and functional reflexes are present. It is possible to effect powerful specific reactions here at the positive pole with specific contacts on two points - one above and one below. All joints are neuter [neutral] points where the energy crosses over, making flexion possible in the lines of force. When energy flows straight it is an extension of force. Through neuter [neutral] points it becomes mechanical leverage by change of polarity. 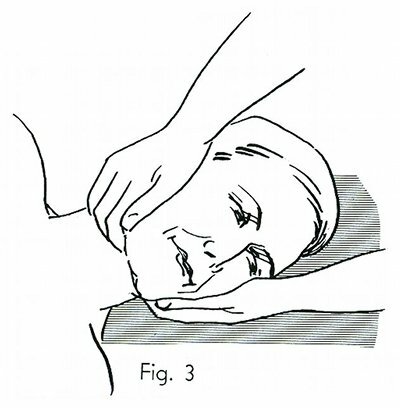 Patient on his back showing a contact under the jaw on both sides as a general stretch of soft tissues. Note the resemblance between the jaw, the pubic bone, the ischium and the ilium. 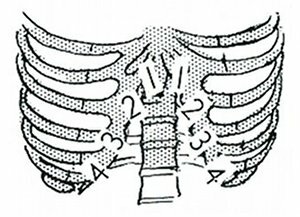 Anteriorly, the diaphragm and immediately below it under the floating ribs, is the neuter [neutral] area for contacts.